Ever encountered any difficulty while importing products from China? Delayed delivery time because the factory can’t complete the order on time, or perhaps a difference in the quality of the product received as compared to the sample reviewed before placing the order. Sometimes you have signed the contract and are all set to receive your order. The production also goes well with quality products ready as per the schedule, but the bad news hits later when you discover that some important certificates required for import are missing.We hear such similar horror stories every day. Why should you choose sourcing agents to handle your imports from China? What factors determine an excellent sourcing agent? How to look for sourcing agent in China? Chapter 1: Why you need a sourcing agent to help you purchase products from China? Let us first find out more about who exactly is a purchasing agent (procurement agent). What will be your first step if you wish to purchase a house or a property? Finding a reliable and professional real estate agent, right? A real estate agent helps you find relevant properties as per your precise requirements and also assists in finalizing the deal, saving you a lot of time, effort and headache. Just like a real estate agent helps you find and purchase the best property, a sourcing agent assists in the process of importing goods from China to your country. The sourcing agent takes away all the burden of the hassle involved in importing the order, making the process of procuring goods from China highly efficient and effortless. If you are looking for a product, you can easily find thousands of suppliers on Alibaba. But determining which supplier will deliver excellent quality at the most reasonable price can be incredibly daunting. However, a sourcing agent can help you find a lot of factories and suppliers that are not available on Alibaba. Their prices are usually the lowest in China. But these factory suppliers don’t speak English, so they can only sell their products to foreign importers through trading companies or sourcing agents. b. Helps you follow up production and save time. Maybe you have already had an extensive network and know a lot of good suppliers. But there’s another hurdle that comes during the actual production process. Since, you are located outside China, following up with the suppliers and ensuring the production is on track as per the schedule may become tedious and the information provided is also not entirely reliable. You need to work with the factory to talk about details about how to produce your product and push the production to finish on time. Usually the entire follow up time will last 1-2 months, and some product development projects will be longer. You can delegate these responsibilities to the sourcing agent and save a lot of time that can be utilized to focus on core business activities. The role of the sourcing agent is more like your interest representative in China. He will be your eyes and hands in China. During the production process, the sourcing agent can visit the factory to see if the products produced meet the quality standards and your requirements. After the goods are ready, the agent can again inspect the quality before shipping the goods to your country. Also, in case of quality issues or discrepancies in order, the agent can help you negotiate with the factory and ensure that the final products are precisely what you ordered. The agent may convince the factory to correct the order or provide alternate solutions. If you ask a third-party inspection company, they can only tell you the result of the inspection is failed or passed. A good sourcing agent has a lot of experience in product production, product safety, compliance certifications, import and export process rules, and international transportation. 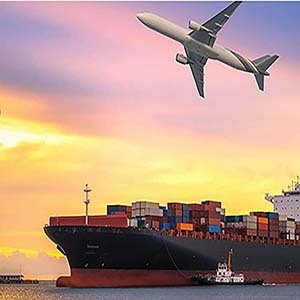 Depending on the product you are purchasing, he will tell you what certificates are needed to import the product into your country, what shipping method is best, and whether the product has potential patent issues. Chapter 2: How to identify a good sourcing agent (procurement agent)? I have already introduced the benefits of a sourcing agent. Let me talk about what qualifies as a good sourcing agent. You can use these points to judge the sourcing agents you are using now or find a good sourcing agent in the future based on these points mentioned below. A good sourcing agent must have a strong command over English in both writing and speaking and should be able to communicate with you smoothly by phone and email. Smooth communication is the foundation that helps develop cooperation and seamless workflow. Ability to communicate fluently and confidently in English also reflects that the agent can be trusted to carry out his tasks efficiently and with ease. On the other hand, if your sourcing agent’s English is weak, it will only cost you time as you will have to communicate your requirements time and again until he understands them correctly. A good sourcing agent must also be highly-efficient and prompt in responding to the emails. There is a time difference between China and most countries. China is 12-15 hours ahead of the US and is 7-8 hours ahead of Europe. Usually, your questions will not be answered until the next day. If your sourcing agent never responds to your emails and messages after work or on weekends, they are not a good fit. In addition to knowing English, it is also essential for the sourcing agent to be quick in understanding the precise requirements of his clients. For example, if the product is complicated and you require a little customization with the material or redesigning some parts, the sourcing agent must be able to understand your requirements so that he can convey the same to suppliers. They can communicate with the factory on behalf of you according to your product ideas. If your sourcing agent can‘t understand your real need very clearly, then it will take more time to modify the product back and forth. There are two main types of sourcing agents, and you need to choose an appropriate sourcing agent according to your own needs. One, those who assist in finding a particular kind of product, such as drugs, machinery, etc. and the others are who specialize in finding products of daily use for consumers. Sourcing agent who specializes in finding suppliers of a specific type of product needs to have a good understanding of the products and relevant professional knowledge as well. Customers who come to procure such products are professionals with sound knowledge of those products. The knowledge and experience of the sourcing agent should at least match his customer so that he can understand client requirements and deliver the same. The agents who deal in all kinds of products have an extensive network of cooperative factories and suppliers. So, they can find the best suppliers for the products you want in a very short time. If you open a supermarket in your country and need hundreds or even thousands of different categories of products, the procurement management can be challenging. In this case, sourcing agents that specialize in providing all kinds of products can prove to be an asset. Any good sourcing agent must have a good understanding of the legalities and paperwork involved in import & export. This includes the process of import & export, certificate and document requirement, licenses, etc. The agents should also know about international transportation. They should have an understanding of what kind of products can’t be transported by air or by sea, or what type of compliance certificate is required for air transportation. In addition to this, the sourcing agent should have knowledge of patents to avoid potential inconvenience while importing. There are tens and thousands of companies and independent sourcing agents in the world that help with procurement management from China. Some are Chinese sourcing agent while the others are based in other countries around the world. Wondering what the difference between the two is. Well, both have their own sets of advantages and disadvantages. Depending upon your requirements, you can choose the agents that best suit your needs. Here are some key points that will help you decide whether you should opt for a Chinese sourcing agent or an agent based in other countries. The sourcing agents based in other countries usually are some foreigners who have experience in importing from China. They may have been to China for a few years, then began with helping import products from China for some friends or people who want to import from China. These foreigners who are engaged in sourcing products from China may not only purchase from China, but generally work in other Asian countries, such as Vietnam, Taiwan, and Malaysia as well. The products in these countries are cheaper because of the low labor costs. So, for instance, if you plan on trading in shoes or clothing, the sourcing agent who is familiar with the markets of other Asian countries may help you procure products from the best market beyond China. However, a sourcing agent who is based in China can only help you procure products from Chinese markets. let’s find out the primary export products of top Asian countries. Chinese sourcing agents may not always have a strong command over the English language, which may cause hindrance in smooth communication. Furthermore, depending on where you are located, there will always be a time difference, which will again impact the flow of communication. Smooth communication plays a pivotal role in making the collaboration with the sourcing agent work. For every foreigner working with a Chinese sourcing agent, time and language barriers are always there. Yet, not all the importers prefer hiring a local sourcing agent. But, If you are unable to tackle the problems arising due to language difference or time gap, you can opt for a local sourcing agent. Make sure he has sufficient experience in importing from China and knowledge of Chinese language will be a huge plus. It’s important to realize that a Chinese sourcing agent has a lot of advantage that your local sourcing agent don’t have. The agents based in China are more efficient in communicating with the suppliers and manufacturers that speak only Chinese since they are well-versed in the language. These suppliers usually offer more competitive price and they only sell products to other countries via trading companies or sourcing companies. China and other countries have significant cultural differences, and hence there’s a difference in the way of thinking of the people. The cultural difference tends to impact communication, interpretation and understanding, comfort level, commitment and at times productivity. Even if the sourcing agent has had experience working with Chinese suppliers in the past, at times traditions, behavioral expectations, folkways, etc. can override understanding, and affect seamless workflow. Sourcing agent commission varies on the quality of his services. If the quality of services of an agent is high, he is bound to ask for a higher price. You cannot expect the cost to be low and at the same time quality to be exceptional. It is noticed that the non-Chinese sourcing agent’s fees are comparatively higher. They generally charge around 10% commission, whereas a China sourcing agent fees is around 3%-10% commission. 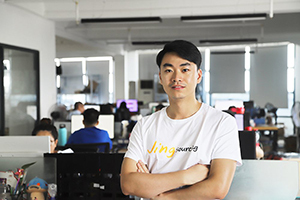 Chinese sourcing agents not only have lower service fees but are also efficient in finding factories that the sourcing agents based in other countries cannot find. Besides, Chinese sourcing agents know more about the market and can help you source the products you want at the lowest price. So a good Chinese sourcing agent can not only help you save on purchasing costs but can also help you find better products. You can find a good Chinese purchasing agent and then establish a trustworthy and reliable relationship. But if this approach seems time-consuming, you can search for a sourcing agent in your country. Next, we will tell you how to find a Chinese sourcing agent, and we will also recommend some sourcing agents based outside of China in the last part of the article. Many China sourcing agents (procurement agents), companies or individuals start their sourcing agent business this way. They only sell certain products at first. Once they establish trust with the customers, they start purchasing other products as well for their customers. Over time, these suppliers become their customer’s sourcing agents in China. Similarly, the suppliers offer their sourcing service to other clients as well. You too can collaborate with your old supplier and convert him into your china sourcing agent. In order to do this, firstly make sure that your supplier is reliable and trust-worthy. Secondly, your supplier should be better a trading company instead of the factory because the manufacturers prefer selling their own products, rather than finding other products. This strategy may work for some individuals but it is not always recommended. Even if your supplier or trading company agrees to help you procure other products from different manufacturers and suppliers, they may or may not have experience in dealing with those products. As such, he is likely to get the product at a higher price from the market or charge an increased price from you for better profit. Either way, this method may not exactly be the most appropriate and cost-effective way to find a sourcing agent. You can start your internet research for a Chinese sourcing agent from Google. Just type in China sourcing agent, and then browse through the search results. Websites for several sourcing agents will come up and your next task will be filtering the results. Not all sourcing agents that appear on the Internet are trustworthy, so you have to review their expertise and evaluate them through their websites. Beware of any red flags by paying attention to the content on the website, a number of years in business, company photos, contact information, the number of team members, infrastructure, customer reviews and testimonials, etc. A good sourcing company must have at least two years of purchasing experience and have at least 30 people on their team. 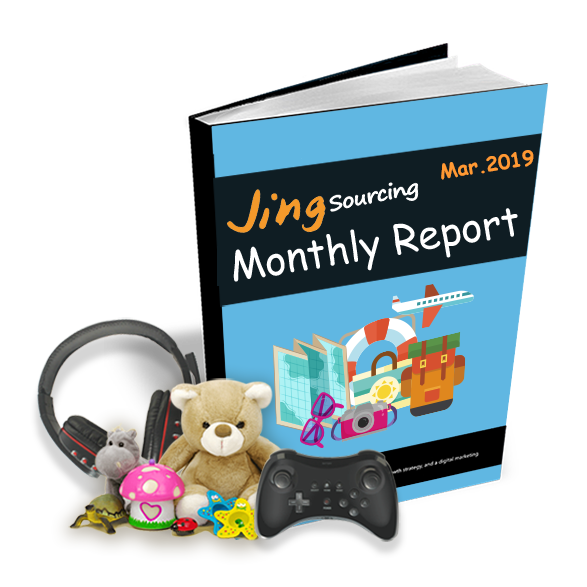 For instance, Jingsourcing Company is a reliable sourcing agent company which has been in business for more than three years and has 40 employees onboard, along with numerous long-term partners. In China, you will also find several big sourcing companies with more than 200 full-time employees. But it is difficult to find these companies on Google because these companies already have an established reputation in the market and loads of big stable customers. They usually do not do online marketing on Google, so it’s hard to find them online. 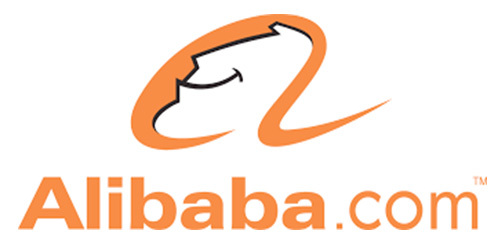 Alibaba is another place to look for Chinese sourcing agents. The platform is known to have lots of sourcing agents that work at low commissions. However, it is difficult to estimate the quality of their services. If you have time and energy, you can use the services of different sourcing agents one by one and compare them. But the risk involved in this method is high, and you might also end up wasting a lot of time. Plus, if the sourcing agents are not professional, you will also run the risk of getting defective or inferior quality products. Upwork and Fiverr are freelancing websites where you can find some independent sourcing agents. Some of them are Chinese, and some are not. If you see a foreigner independent sourcing agent, he will help you find a supplier and inquire the price on alibaba.com, then provide you with a supplier’s report. You will then need to contact the supplier yourself. If you find an independent sourcing agent based in China, he may help you to find a product on 1688.com or may also assist in purchasing goods directly from the factory. But these freelancers are personal businesses. If you directly send tens of thousands of dollars in cash transfer or western union to them, you will be taking the risk of becoming a fraud victim. In addition to looking for Chinese sourcing agents online, you can also pay a visit to trade fairs to find China sourcing company directly. Some of the most popular trade fairs are the Canton fair, Hong Kong fair, and the Yiwu international fair. But looking for a sourcing company at an fair more suitable for big importers, such as supermarkets. These big importers spend millions of dollars in purchases every year and need to import hundreds or thousands of different types of products. In this case, a big sourcing company is more suitable rather than a small sourcing company of 2-5 personals. 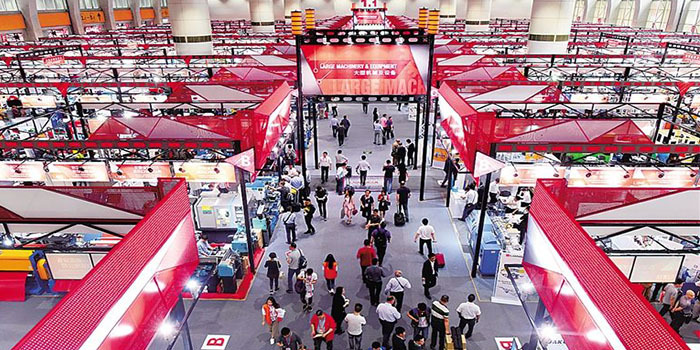 If you are just a small or medium-sized importer with only tens of thousands of dollars in purchases per year, the fairs may not be the best place to find suppliers. The sourcing agent ( procurement agent ) of different cities in China are different and have their unique specialties. When you are looking for a China purchasing agent, I suggest you pay attention to which city your purchasing agent is located in as it comes with its own advantages and disadvantages. After you understand the difference between sourcing agents in different cities, you can choose the most suitable china sourcing company according to your needs. 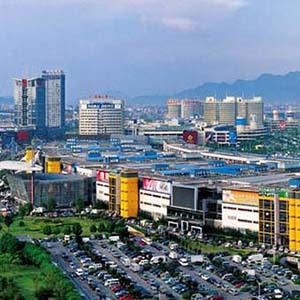 Most of the sourcing agents in China are based in Yiwu because Yiwu has the largest wholesale market in the world. The domestic logistic from any city in China to Yiwu is cheap, and the offices and warehouses in Yiwu are rented at relatively lower rates than other cities. 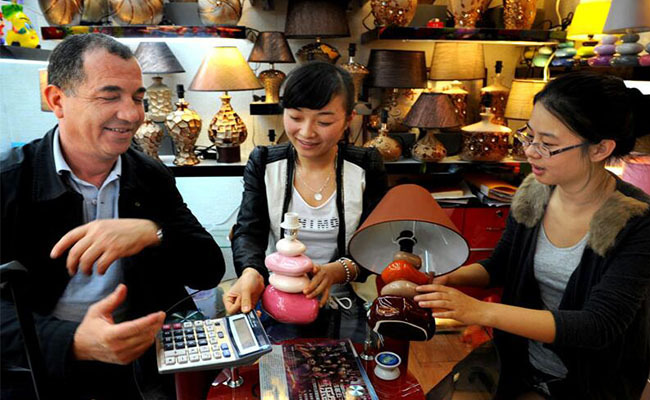 Therefore, large china sourcing companies also have branches in Yiwu. 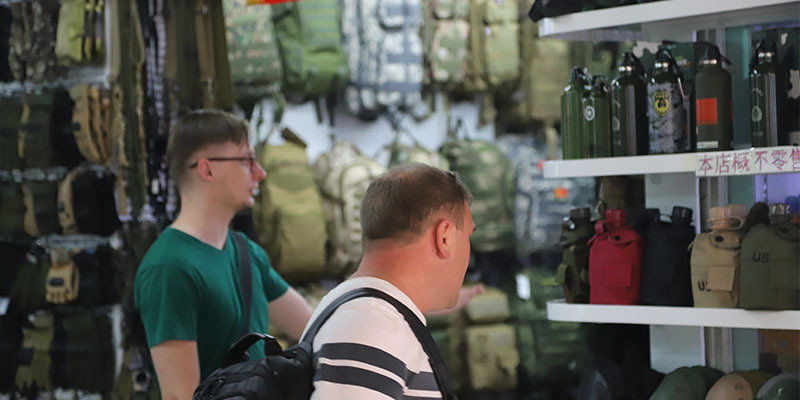 In Yiwu, the sourcing agents who mostly procure daily use consumer products are more efficient to work with since they are quick in finding the products required. There are several sourcing agent companies in Yiwu as well. Most of these agent are relatively small with a team of 2-20 people. However, you can also find sourcing companies with a strength of over 50 or 100 people. So, no matter what type of importer you are, you can find a suitable sourcing agent for you in Yiwu. Wondering how to get in touch with one of Yiwu’s sourcing agents? Well apart from the internet, you can look anywhere in Yiwu and are bound to find advertisements for sourcing agents everywhere. 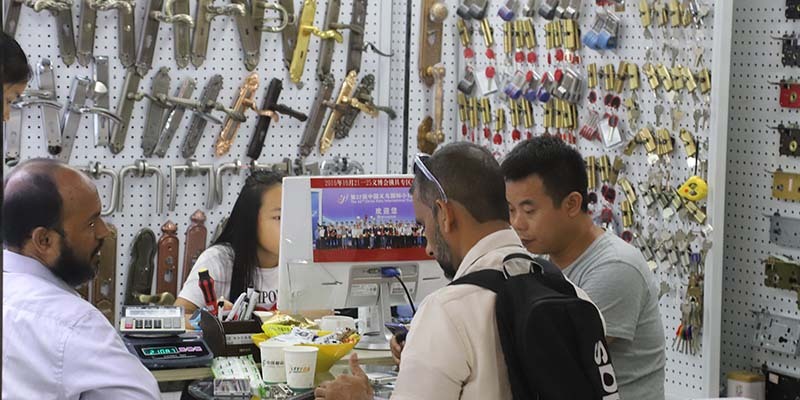 From the airport to the railway station, and even the Yiwu wholesale market, there are advertisements everywhere, which makes it easy to find sourcing agents in Yiwu. 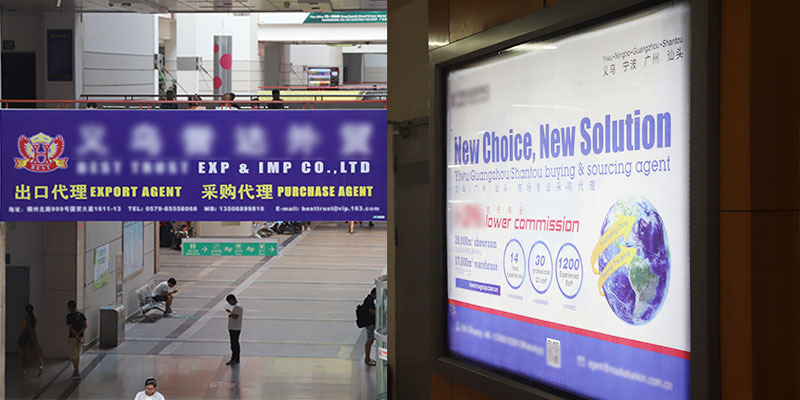 Yiwu’s sourcing agents are divided into two types. There are sourcing agents who directly take you to the market to purchase goods and then there others who buy goods for you, no matter whether you are visiting China or not. For a small scale importer, if the quantity of products is not very large, visiting Yiwu may turn out to be very uneconomical. Unlike sourcing agents in other cities, most Yiwu sourcing agent companies have their warehouses. So, even if you are purchasing goods from other suppliers, they can store your cargo and help you consolidate the shipment and transport to your country. For more information read this: Sourcing product in Yiwu wholesale market. The sourcing agent industry in Guangzhou and Shenzhen is not as developed as Yiwu. Most of the sourcing companies are small-scale and have only 3-10 people. In addition to that, you won’t even find many sourcing agent advertisements in these two cities. So, the only way to search for potential sourcing agents in Guangzhou and Shenzhen is the Internet. It is recommended that you do your research before coming to China. Here, I recommend a sourcing company in shenzhen—-leelinesourcing. 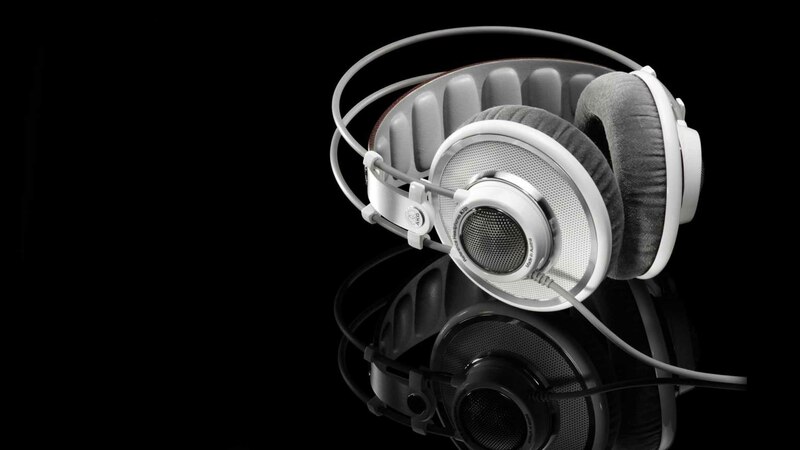 Electronic products such as mobile phone accessories, computer accessories, electronic cigarettes, monitoring devices, etc. are mainly concentrated in Shenzhen. 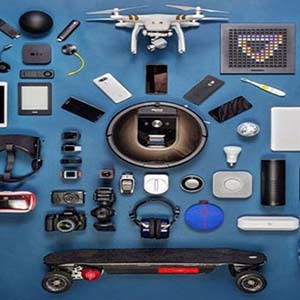 Maybe, you can choose China Sourcelink, which is able to provide complete and tailor-made supply chain solutions for consumer electronics. Products such as clothing, jewelry, shoes, bags, and watches, etc. are can be easily found in Guangzhou. 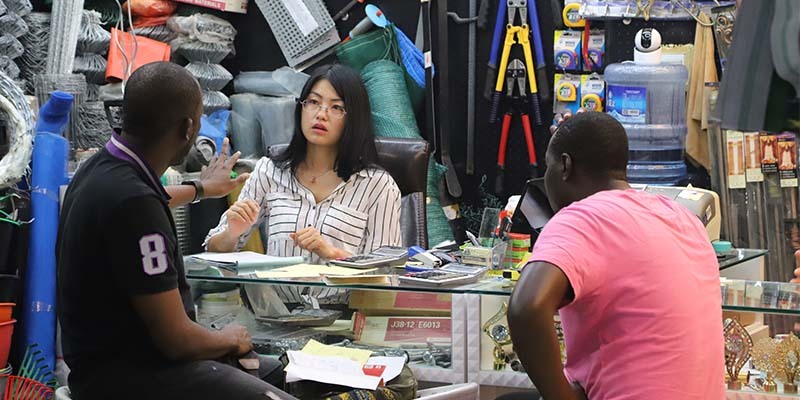 In Guangzhou and Shenzhen, there are several wholesale markets to find product suppliers. But you will need to hire a local sourcing agent to help you interpret suppliers, make purchases, and help manage the shipment. 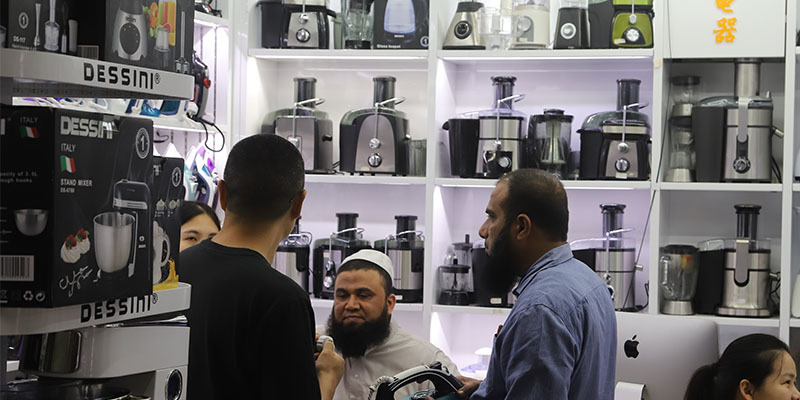 In addition to shopping around the wholesale market, you can also ask the local sourcing agent to guide you to the Canton fair, or factories in the nearby area, where you can find suitable suppliers and manufacturers. Guangzhou sourcing agent and Shenzhen sourcing agent also have a disadvantage. Most of them do not have their own warehouses. They can only help you go to the factory or the warehouse of the freight forwarding for inspection. Additionally, some freight forwarding companies in Guangzhou or Shenzhen are also involved in purchasing agency work. But they can only take you to the wholesale market in Guangzhou or Shenzhen for purchasing goods. After you make the purchase, the product suppliers will have to send the goods to the warehouses of the freight forwarding company. In China, there are a lot of industrial clusters, which means you will find some cities or areas that specialize in producing a specific type of product. If you are looking for something, visiting the related industrial cluster will be a good option. You can find a China product sourcing agent to help you. For example, Chenghai specializes in toys. 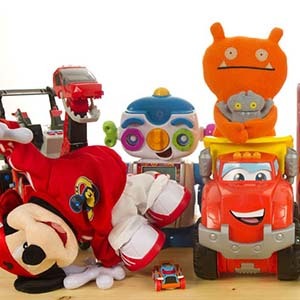 When you go to Chenghai to purchase toys, you can find a toy sourcing agent in Chenghai (if you are looking for a toy supplier, refer to this article for detailed information: How to import toys from China). If you want to purchase furniture, you can go to Foshan to find a furniture sourcing agent. Similarly, if you’re going to buy fabrics, you can go to Shaoxing to find a fabric sourcing agent. There is a table of industrial clusters for some industry category for your reference. 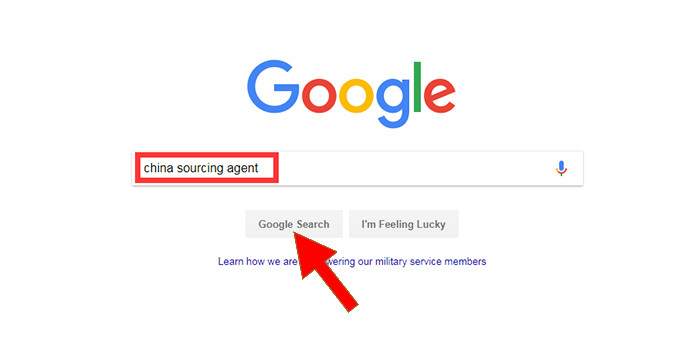 Do you want to find a sourcing agent right now? I hope this article could help you understand sourcing agent better. If you have any problem or confusion after going through this article, just leave a comment. We will try our best to help you answer your questions and solve your issues.